So, I snatched the 2nd place in inaugural Pong Yaeng Trail 166 km in Chaing Mai, Thailand. I started at 10:00am on November 9th, 2018, and it took me just over 29 hours. Out of 138 males started, 50 did not finish , and in this Race Report I'll tell you how I did it. First, about me. My name is Arseny Chernov, I'm an amateur Ironman (Personal Best 10:35 in 140.6) and ultra-runner from a pancake-flat city of Singapore, and my full-time job is with Data Analytics & Machine Learning company called Databricks. Together with my wife, I run a small endurance and coaching business called Foodbuddy. We educate mentees 1x1 and speak at large corporate clients, teach cooking, and participate in AirBNB Experiences. I got a Specialist Diploma in Nutrition Science so there's a lot of cool content on our 12,500+ followers Instagram @foodbuddy , so follow us there! We also often run some giveaways and different quizes, so you'll like it. Oh, by the way, if you're just interested in my set-up (gear I used, food I've eaten) - scroll down to the very bottom, there's a summary. My finisher time was 29 hours 18 seconds . The winner, Bangkok-based Thai runner, Jag Lanante, brought me almost 3 hours. Jag is quite an ambitious and well-known runner, -- you may have seen him as a featured challenger of Hong-Kong Four Trails Ultra Challenge (HK4TUC) in "Breaking 60" movie. He was focused on breaking 60 hours at HK4TUC for 3 consecutive years now. For this race report, I've asked him a few questions over e-mail after the race, so you may think of this report as our "collaboration". Oh yes, Jag's also an amateur athlete, with full-time job as a hospital worker in Bangkok. 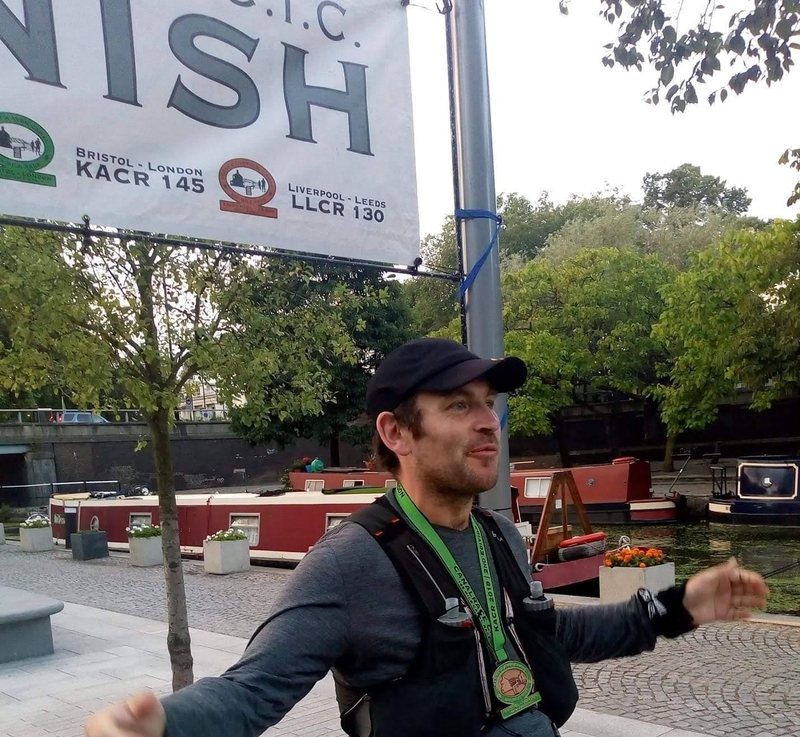 He says it was a "warm-up" before his A-race for 2018, Oxfam Trailwalker, that was just 7 days after PYT. Honestly... I don't believe him, -- he pushed really hard, and I'm proud of him! Let's start with basic. Neither Jag nor me used poles over this 8000 meters total climb. Apparently, we both had same mindset: if you can't train with poles in a terrain similar to Chiang Mai, you might be very distracted and demotivated during the race. Bangkok and Singapore are flat, nowhere near to race profile, - so we both didn't bother Also, November in Chiang Mai is often quite rainy, - which was our case, so net benefit of having poles will be offset by slippery roads where you'd anyway slow down for lugs on the shoes to work. Chiang Mai itself is a really old city, that used to be capital of Thailand until 18th century. Full of UNESCO heritage temples, hip cafes, vegan food options and running shops, in case you forget something. Also, check in to the BaseCamp Coffee house when you come over, it's the brekkie place for many legends travelling through. The race course takes runners around so-called "Royal Projects", - vast amount of agricultural terraced fields that were built during the 20th century, during the reign of King Rama IX (the father of current King). King Bhumibol Adulyadej travelled around rural areas of Chiang Mai by foot, and convinced a lot of villagers to stop illegal farming of (...i.e. of poppies, that were used by gangs to produce opiates) so that instead Chiang Mai could develop a sustainable agricultural economy aimed at export. He invested Royal Family money in few high-altitude agriculture research stations, that race takes one through, to understand how Thailand can benefit from growing vegetables, berries and fruits at large-scale, to become a well-known exporting country of a scale that it is today. Chiang Mai is a beautiful city, an old capital of Thailand, with a massive amount of sightseeing tours, hip cafes and really great restaurants. so if you're travelling with a group that's not running, their agenda might be pretty packed while you're battling the muds of rural areas. Sunrise in November, when the race starts, is around 6:30am, and sunset is 5:50pm. Thailand is in UTC+7 time-zone, so when you travel from abroad, make sure you adjust. This year, there was no moon at all, - although in Thailand with full moon you can pretty much see anything. Race starts at Queen Sirikit Botanic Garden (QSBG), and goes straight in to forests. The bag drop at Aid Station 5 allows runners to access their bag drop goods around 1 marathon distance in to the course. 166km route also has a dinner place at 60 km mark, right back at QSBG. It was somewhat demotivating for a number of runners, that after the after 60 km mark and coming back to finish mark at night there's an additional loop of 40+ km to take, including hiking up the Doi Pui (or Doi Suthep) peak, the highest peak on entire route, with 1,676 m elevation, before starting the 60km distance made in reverse. When the loop reverses, at 121 km mark, there's again one more chance to make use of the same bag drop again. The bag drop rules prohibit leaving or picking trail-running poles. You have to carry them, if you choose to, the entire 166 km race. Mandatory equipment is quite light. What needs to be noted is that it's a cup-free race. Because the course is also used by PYT100, PYT66 and other races, the order of aids stations is a bit unusual. For PYT166, it goes like this: QSBG->A1->...->A7->QSBG junction->QSBG (dinner! )->QSBG junction->A10->A9->A8->QSBG junction->A7->...->A1->QSBG. This year, the temperature during the race ranged from +25 C high down to +12 C low, and one can always cross-check the averages at local weather station web-sites. I didn't have to use my WAA Rain Jacket, and finished all race in a WAA Ultra carrier shirt (see picture above). The rain started quite early, just about 20 km in, and developed from drizzles to solid drops quickly. While in the forests, runners are quite protected with the tree canopy, but out of the woods, Thai rain equals to taking an intensive, yet warm, shower. Ok, enough about the roads, let's talk about the aid stations! 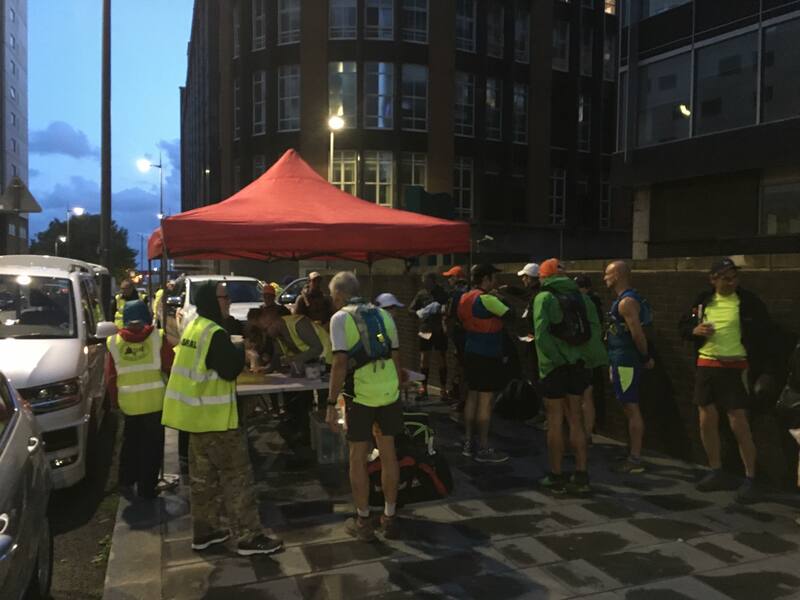 All aid stations had ice water, electrolyte drink and some snacks. They were, if I'm not mistaken, some dry waffle bars. I don't remember the details, but they ver very low-energy content, like 50 Cal per serving, and as they were also very dry, I didn't look at them even when I had to run A7 to A6 almost empty. Every aid-station also had some fruits: all stations had bananas, and odd versus even had guavas and oranges. That was a very important support, as 100g of guava has 228.3 mg of ascorbic acid (Vitamin C), making it one of the most loaded anti-inflammatory food choices in the world. Every second aid station had plain white rice and hot water. Again, odds versus even there were muscle coolant gels and aerosols. 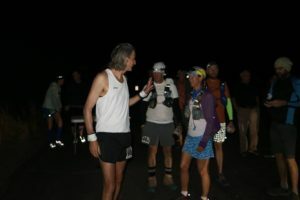 One thing that the aid stations didn't have were any kind of wet tissue papers or simple napkins, - so washing hands after using the coolant gels was a bit of a problem. Plenty of villages on the way with rural shops selling coca-cola, ice-creams and whatever you may have cravings for. There are no specific regulations in the race that prohibit buying up something, if I'm not mistaken. They close up late, around 11pm or even later, but they also open late, not earlier than 10am or so. Every aid station also works as a checkpoint. There's a bar-code both on the race passport, and on the bib. My race passport got wet almost immediately, and I didn't bother putting it in to a zip-lock, -lucky for me, the ink from all those stamps that volunteers chop on to it withstood the nasty weather quite nicely. Oh, almost forgot, - here's a picture of an endless cabbage field in the night, you will not be able to un-see this! It looks like a field full of snow! When running through bushy and tall grass, avoid anything with buds or spica, and move them away with your hands. Thailand has all sorts of allergens in those crops for you. Train with poles long in advance for this race. As usual, it's not the hike-up that kill you, it's the quads' fatigue on descents. I didn't use poles, but if I did, I'd probably chop off at least an hour off my finish time, if not more. Eat well, and ensure sufficient protein intake. Not much you will get along the way, and all the hot food options will most likely be Thai famous flavoured with spices. Go light first, re-load your race backpack from drop bag, and take a lot of stuff. From 40 to 120 it's a bloody long way, including the hike over Doi Pui (orDoi Suthep) peak, so it's the only chance for you to have your planned carbs, protein supplies re-charged. I left the sunglasses and visor for the night, and picked them up in the morning. Use a larger vest. I used an 8.5L Ultimate Direction SJ 3.0 Ultra Vest and it was a bit too small for the amount of stuff to carry. I didn't struggle, - the bag did, but I'd add maybe another 2.5L of volume. Top: Waa Ultra Carrier Shirt - worked out nicely for me, I highly recommend the sleeveless version. Really good top. Bottom: Waa Ultra 3-in-1 Ultra Short - they actually are too loose on the belt, and too tight on the quads, - so they were slipping down and caused quite a discomfort. I've let WAA know, but they say there's nothing they can do, and suggested I go to a tailor to fix it somewhere. Hmm. Shoes: HOKA ONE ONE Challenger ATR 4 - I personally think that the tarmac to mud ratio in this race might've been more favorable to something more of a road-shoe, than trail-shoe. I've checked and the lugs were noticeably worked after the race, maybe because of those "reinforced" roads. Also, as I understood, Jag actually ran in HOKA ONE ONE Clifton 3 for the same reason. Socks: Injini Men's Run Lightweight Mini Crew Toesocks (inner) + Drymax Run Hyper Thin Mini Crew Socks (outer), combination works very well to keep the foot dry and prevent blisters. Rain Jacket: Waa Ultra Rain Jacket 2.0 - didn't use it, but it's ultra-light. I've tested it in San-Francisco and it works as designed, I really liked this jacket. Bag: Ultimate Direction Scott Jurek Vest 3.0 - as mentioned, I'd take something larger next time. I'm not happy with my choice. Hydration: Ultimate Direction 500ml Body Bottles, Camelback Podium Big Chill 750ml bike bottle. I hate bladder as it's troublesome to mix my satchets in to it (see below). Chafe prevention: GurneyGoo with antiseptic - I used it many times along the course, it was really working well. GPS Watch: Garmin Forerunner 935 - I had a bit of cursing importing the map, but it worked out perfectly. Don't go there without the map, guys. Headlamp: Lupine Lighting Systems Piko RX 4 - I entirely used 1 x 3.3 Ah SmartCore Battery and used spare battery to charge Garmin once. Carbohydrates: Tailwind Nutrition Stickpacks , GU Energy Lemon Sublime No Caffeine Gel , - my tested combination that always works together well. Most of the Tailwinds were with caffeine, some not. Protein: Nuzest Clean Lean Protein 100% plant-based bars. Takes time to adjust but incredibly tasty. Electrolytes: SaltStick Caps without Caffeine and SaltStick Caps with 30mg Caffeine - was a good combo, I've switched to the ones with caffeine after 1am and it was a great help. Like I mentioned, my wife and I run quite a popular (12,500+ followers) Instagram @foodbuddy , and we're also on Facebook @foodbuddy ! We do have giveaways once every now and then, quizes, so look forward to re-connecting there! I'd be happy to answer your questions about the PYT166, leave them in comments!..